After having been stationed as the commandant at Fort Michilimackinac, the most important of the outer fur trading posts between Quebec and Montreal, French Lt. Antoine de la Mothe Cadillac devised a plan to preserve the French fur trade in the Americas. In hopes of preventing the English from gaining control over the fur trade, Cadillac returned to France to garner backing for his idea which centered on developing a new fort where Lake St. Clair pours into Lake Erie. He believed the location to be extremely strategic as it would give France control of the entire upper lakes region as the most efficient form of inland transportation utilized waterways. Cadillac received the necessary backing from the French government under the rule of Louis XIV, and so in 1701 he landed at what is now recognized as the city of Detroit (French for “de troit” meaning “the strait”). Cadillac and his accompanying settlers and soldiers began building Fort Pontchartrain and developed the Fort and its surrounding land. 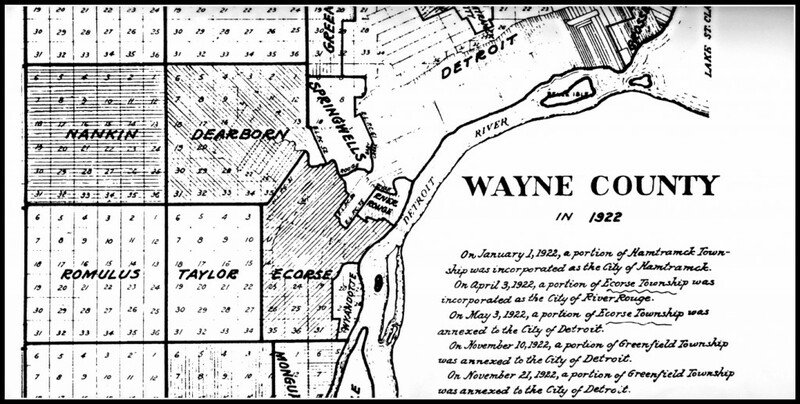 As the Detroit settlement began to expand, it did so along the rivers, north and south, along the Detroit River and the Rouge River (French for “red river”). The descendants of Cadillac and those who first accompanied him became a large part of the population that made up the area that was to become River Rouge. The specific location of Detroit and the later developed River Rouge was so advantageous as it was situated between the iron ore of the upper peninsula and the coal mines in the eastern American states. With such accessibility to these raw materials, the development of manufacturing was surely inevitable, thus making manufacturing inseparable from the history of the City of River Rouge. Before the area transitioned from farmland to a factory-sustaining city, it passed through several stages of growth. What was once a footpath that travelled along the Detroit River became part of the oldest highway in Wayne County. First coined “River Road,” today River Rouge citizens know this as West Jefferson Avenue. Less than a miles south of the Rouge River, “Dearborn Road,” a military highway that lead to an early arsenal for the United States, intersected with “River Road.” The old “Dearborn Road” was later renamed Schaefer Highway, which is known as Coolidge Highway within the proper limits of River Rouge. As the area developed along with the rest of the state, fifty-four square miles of the Michigan territory outside of Detroit were established as Ecorse Township. Michigan officially became a state 10 years later, but it wasn’t until 1899 that River Rouge followed suit and became officially incorporated as a village. River Rouge changed from village to city years later on April 3, 1922.